Escape the urban bustle at Trinity Beach and Scuba & Snorkeling. Explore hidden gems such as Australian Butterfly Sanctuary and Josephine Falls. Take a break from Cairns with a short trip to Spas & Wellness in Palm Cove, about 30 minutes away. The adventure continues: enjoy unforgettable views with a balloon tour, pause for some photo ops at Cairns Cenotaph, let the river carry you with a rafting and tubing tour, and explore the striking landscape at Earl Hill. For traveler tips, other places to visit, reviews, and tourist information, you can read our Cairns online tour itinerary builder . Kaunas, Lithuania to Cairns is an approximately 33-hour flight. The time zone difference moving from Eastern European Time (EET) to Australian Eastern Standard Time (Queensland) (AEST) is 8 hours. When traveling from Kaunas in May, plan for somewhat warmer days in Cairns, with highs around 32°C, while nights are much hotter with lows around 24°C. Finish up your sightseeing early on the 11th (Sat) so you can travel to Airlie Beach. Eschew the tourist crowds and head to Kayaking & Canoeing and Grotty Yachty Clothing. Escape the urban bustle at Horseshoe Bay and Grays Bay. Change things up with a short trip to The Big Mango in Bowen (about 46 minutes away). Spend the 13th (Mon) among aquatic life with a scuba or snorkeling tour. There's still lots to do: kick back and relax at Whitehaven Beach. To find reviews, more things to do, traveler tips, and other tourist information, use the Airlie Beach trip itinerary planning website . Traveling by combination of flight and ferry from Cairns to Airlie Beach takes 5 hours. Alternatively, you can do a combination of flight and bus; or drive. When traveling from Cairns in May, plan for little chillier days in Airlie Beach, with highs around 28°C, while nights are about the same with lows around 24°C. Finish up your sightseeing early on the 14th (Tue) so you can travel to Mooloolaba. Kick off your visit on the 15th (Wed): enjoy the sand and surf at Mooloolaba Beach, then kick back and relax at Kings Beach, and then look for all kinds of wild species at Buderim Forest Park. On the 16th (Thu), you'll have a packed day of sightseeing: identify plant and animal life at Wildlife Areas, explore the historical opulence of Sunshine Castle, and then tour the pleasant surroundings at Peregian Beach. Discover how to plan a Mooloolaba trip in just a few steps with Inspirock's itinerary builder. Traveling by combination of bus and flight from Airlie Beach to Mooloolaba takes 5.5 hours. Alternatively, you can drive; or do a combination of bus and train. Plan for a bit cooler nights when traveling from Airlie Beach in May since evenings lows in Mooloolaba dip to 15°C. 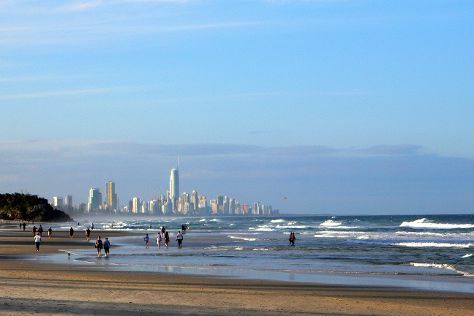 Finish your sightseeing early on the 16th (Thu) to allow enough time to drive to Gold Coast. Get in touch with nature at Coolangatta Beach and Natural Bridge. Visit Burleigh Heads Beach and Kirra Beach for some beach relaxation. There's lots more to do: tour the pleasant surroundings at Burleigh Head National Park, enjoy breathtaking views from SkyPoint Climb, play a few rounds at Surfers Paradise Golf Club, and kick back and relax at Kurrawa Beach. For maps, traveler tips, more things to do, and more tourist information, use the Gold Coast trip builder app . Getting from Mooloolaba to Gold Coast by car takes about 2 hours. Other options: take a bus; or do a combination of bus and train. In May, daytime highs in Gold Coast are 27°C, while nighttime lows are 15°C. Finish your sightseeing early on the 19th (Sun) to allow enough time to travel to Longreach. Longreach is a town in Central West Queensland, Australia approximately 700km from the coast, west of Rockhampton. Kick off your visit on the 20th (Mon): see the interesting displays at QANTAS Founders Museum, then see the interesting displays at Australian Stockman's Hall of Fame and Outback Heritage Centre, and then steep yourself in history at Longreach. To find ratings, maps, photos, and more tourist information, read our Longreach trip itinerary planner. Do a combination of train and flight from Gold Coast to Longreach in 5.5 hours. Alternatively, you can drive; or take a bus. When traveling from Gold Coast in May, plan for a bit warmer days and about the same nights in Longreach: temperatures range from 32°C by day to 15°C at night. Finish up your sightseeing early on the 20th (Mon) so you can travel to Port Douglas. Discover out-of-the-way places like Daintree National Park and St Mary’s by The Sea chapel. Get outdoors at Safaris and Hartley's Crocodile Adventures. Spend the 21st (Tue) among aquatic life with a scuba or snorkeling tour. There's still lots to do: relax and rejuvenate at some of the top local wellness centers. For more things to do, photos, reviews, and tourist information, read Port Douglas trip planner . Do a combination of flight and shuttle from Longreach to Port Douglas in 7.5 hours. Alternatively, you can drive; or do a combination of bus, flight, and shuttle. Traveling from Longreach in May, plan for somewhat warmer nights in Port Douglas, with lows around 24°C. Cap off your sightseeing on the 24th (Fri) early enough to travel back home.